Not that our time in Edinburgh hadn’t been a blast, but David and I were both excited to get in a car and get exploring. As it was a Sunday, the earliest we could get our rental was 10 am, which ultimately was fine for us as it gave me a chance to finish packing things up and D an opportunity to walk over to the rental office. With our Toyota Auris in hand, we bid goodbye to our hosts and tackled our first challenge: getting out of Edinburgh. While I had Google directions ready to go, we somehow (repeatedly) missed the street it wanted us to turn onto, so we ended up just pointing the car in a westwardly direction and hoping for the best. Thankfully, we found signage for Glasgow that confirmed we were on the right road going in the right direction. It wasn’t long before we were happily blasting along the M9 towards Stirling. We had a fair bit of ground to cover, so I didn’t think we’d have time to actually go into Stirling Castle. However, given that it’s situated on a hilltop, I thought it might be nice to swing by and have a look. We made a brief pit stop for food and supplies before heading into the cute little town of Stirling. We meandered our way up to the castle before veering off down a side road to find a place to park. We parked next to an old cemetery and walked around to get a good vantage point of the castle. We ended up stumbling upon a pathway lined with bramble (blackberry) bushes and with a lovely view of the surrounding glen. After we’d had our fill of bramble and castle views, we hopped in the car and headed off towards Loch Lomond, the largest loch in Scotland. We’d actually been through this area of the countryside on our trip 5 years ago, strangely enough. We went out to visit a University of Edinburgh professor at her house, and past by Loch Lomond (without knowing it at the time), since the drive out was spontaneous and not well-researched. There was certainly no harm in seeing it all again, as the weather was just beautiful for a drive through the rolling Scottish hills. As we neared the loch, we pulled into the village of Luss to find a spot by the lake for a snack and a view. It was bustling with activity (even with a pay parking lot), and the beach was full of vacationers. We sat down with our cheese and crackers and watched a small flock of ducks and swans bully the tourists into feeding them (after they had made the mistake of giving them a bit of bread). We wandered down to the dock, where Scottish wedding photos were taking place with men in full kilts and a bagpiper. From there, we headed northward, into the Highlands, stopping frequently at the pull-outs by the side of of the road (which were thankfully relatively plentiful) to admire and photograph the scenery. David and I marveled at the truly epic landscape, helped in no small part by the breaking clouds and shafts of light streaking down to highlight the hillside. 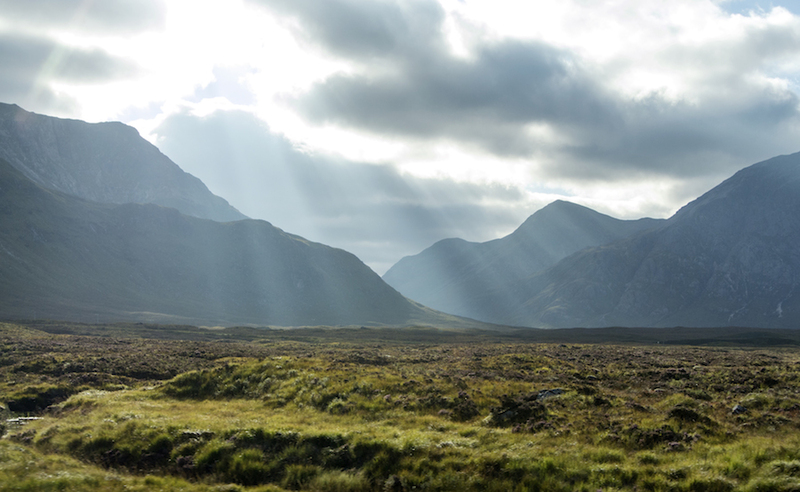 There was an ethereal, Middle Earth-like quality driving through the Highlands. We were almost sad to have to go off and find our accommodations, Glendevin B&B, situated along a loch just past Glencoe in the tiny hamlet Inchree. Our hosts greeted us warmly and provided tea and shortbread cookies, which always endears me to a person, and we got settled in before deciding on a place to eat. Our host recommended Lochleven Seafood Cafe, just a 15 minute drive away. During my research, I’d come across this place, so we thought that was a good sign and made a reservation. David quickly ordered a few oysters as well as marinated anchovies, before deciding on Scottish brown crab for dinner. I was feeling a little less adventurous and opted for a land-based dish–gnocchi with butternut squash, mushrooms and a roast garlic velouté. Everything was delicious, and I even sampled a few of the marinated anchovies, which were quite tasty. David happily dug into his brown crabs (they had given 1.5 crabs) and merrily cracked and dug for his meat. He was mildly disappointed that it was served cold, but he was pleased with its flavour, reminding him somewhat of Dungeness crab. When it became apparent that he would be dismantling his crab for some time, I ended up ordering a cheese plate after I’d finished, which was also delightful. Our neighbours, a sweet old couple vacationing from the Glasgow area, chatted us up about our travels and our research. I found out that the woman had even worked in the Yukon and Calgary for a time (small world). After we’d had our fill, we headed back to the B&B, where I settled in for the night and D headed around the corner to the local pub for a nightcap. Unsurprisingly, he made fast friends with the bartender (a top-knot adorned young man). D noted that whenever frequenting a bar back home, he always asks someone with an accent where they’re from or what they’re doing, so he thought it was amusing to be the one on the other side of that conversation. This entry was posted in europe, scotland, travel. Bookmark the permalink.